last few days I have a problem with opening certain page, others seems are opening fine. Every time appears Server could not be found. I'm using the latest version of Mozilla. I've also tried to open it with other browser but it's the same. I think my internet connection is slower as well. With cmd I reset IP configuration and still no result. My OS is Win 7 and I'm using LAN. Can you reach those inaccessible pages using another device, such as a smartphone or tablet? I just tried to connect on that page with another computer and I reached it without issues. Does it work okay if you reboot into "Safe Mode with Networking" (and then try Firefox)? If so, then try using System Restore to roll back Windows to a point in time when your computer (Firefox) was functioning correctly. It allows you to undo system changes without affecting your personal files, such as e-mail, documents, or photos. It works in Safe Mode and internet is fast too. I can't use System Restore because no restore points have been created. Why are there no restore points? My next step then would be to restore my latest backup, (image file). I think because I used Auslogics Disk Defrag and optimized & defragmented HD. I don't have any backups on my computer, I always backup everything on my external HD. Then restore the latest backup from your external hard drive to your computer. The idea is to try to get back to a point in time when your computer was working correctly ... so that you're NOT left having to dig through Windows' and other programs gadzillions of settings. If Auslogics didn't erase restore points then maybe CCleaner did. When I try to restore the latest backup I get this message...the same happens if I disable antivirus or if I choose a different restore point. 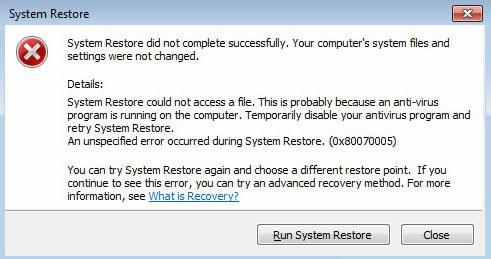 Try running System Restore from Safe Mode ... so that no programs (other than Microsoft's) will interfere with it. I managed to restore my computer to a earlier point and now sometimes I can open that page, sometimes I can't. When I can it doesn't load completely and internet is very slow. Ok, I run FRST...should I paste the logs here or create new topic ? I will post in new topic then...thank you !